July 17, 2015, 6:52 p.m.
Donald Trump’s positions on immigration are resonating with Republicans, most of whom agree with the characterization of Mexican immigrants he made in his announcement speech. But the latest Economist/YouGov Poll finds far fewer outside his party thinking well of Trump, even while Trump continues to gain Republican favor. Two out of three Republicans agree with Trump’s statement of two weeks ago (asked in this poll without indicating who said it): “When Mexico sends its people, they’re not sending their best. They’re sending people that have lots of problems. They’re bringing drugs. They’re bringing crime. They’re rapists.” Overall, Americans divide on this. It’s clear that illegal immigration is a concern for many Americans. Half describe it as a very serious problem for the country, although far fewer, 18%, call it a problem in their local communities. Republicans are even more likely to see immigration as a very serious national problem, but less than a third see it as very serious in their own communities. While the public overall offers leniency towards at least some illegal immigrants, most Republicans do not. Two out of three Republicans would keep children who are in the country illegally out of public schools. Nearly half oppose any offer of a pathway to citizenship for those here now, even if they submit to background checks, pay fines and hold jobs. A majority of the public overall would favor some path to citizenship, and less than half would keep illegal immigrants out of schools. While 61% of the public would allow illegal immigrants here now to remain, with the possibility of either eventual citizenship or legal residency, 55% of Republicans say they would deport all illegal immigrants. Last week’s shooting of a tourist in San Francisco, allegedly by an illegal immigrant who had been deported five times, raised questions for many on the relationship between immigration and crime. 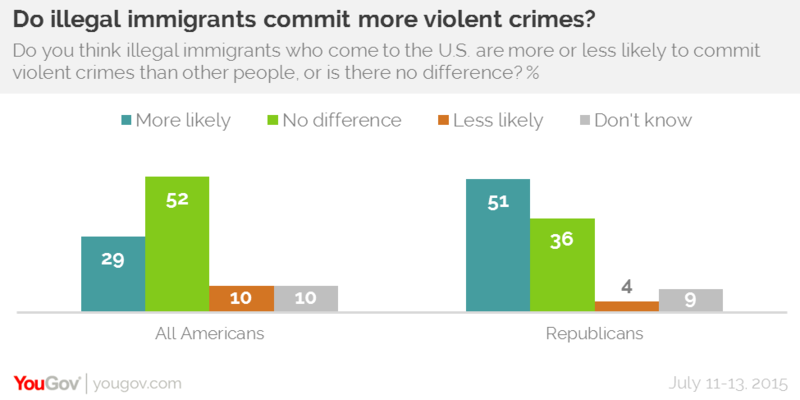 A majority of the public thinks that illegal immigrants are no more likely to commit violent crimes than others. A majority of Republicans think they are more likely to do so. Nearly everyone supports something the San Francisco Police Department did not do before the shooting. 67% of the public and 83% of Republicans would require police departments to report illegal immigrants to the federal government. San Francisco, which designates itself as a “sanctuary city,” has forbidden police from reporting illegal immigrants to the federal government. If they had done so, that might have resulted in the transfer of the alleged shooter to federal custody before the killing. Trump’s stated toughness on illegal immigration has made him the preferred candidate on the issue among Republicans. It also appears to have raised his standing overall with Republican voters. Republicans are three times as likely to say that Trump would be best at handling immigration as to prefer former Florida Governor Jeb Bush on that issue. In fact, Republicans reject a statement made by Bush: “Yes, illegal immigrants broke the law, but it’s not a felony. It’s an act of love, it’s an act of commitment to your family.” Only 20% of Republicans agree with that; 69% do not. 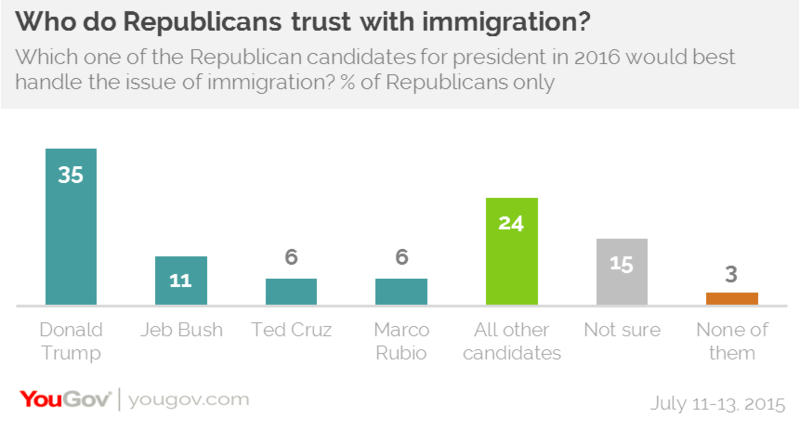 But Republicans aren’t just rejecting Bush’s position on immigration, they may also be embracing Trump. There has been a 15-point jump in Trump’s favorable rating among Republicans in the last week. 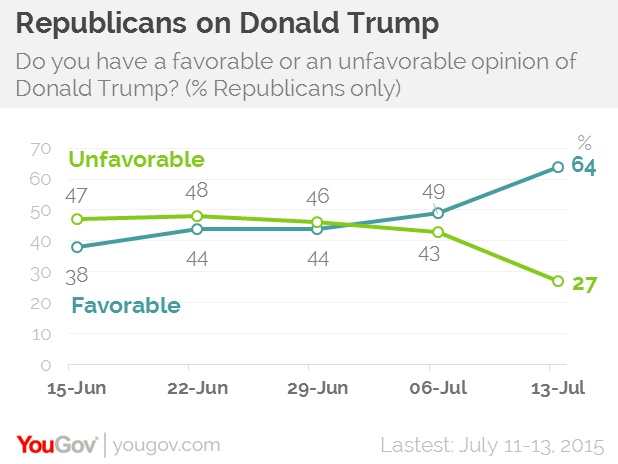 While one in four Republicans remain unfavorable, Trump’s favorable rating among Republicans this week is higher than the favorable ratings of the other announced and about-to-announce candidates. Bush is still seen favorably by half of Republicans, but this week one in three Republicans are unfavorable towards him, an increase from the beginning of the year. Overall, however, Trump – and Republicans – may have a longer-term problem with the immigration issue. 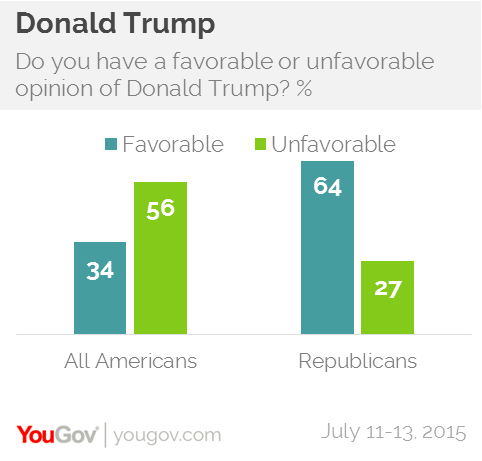 Asked about Trump, Americans overall are clearly unfavorable: only a third have a favorable opinion towards him, while 56% are unfavorable. 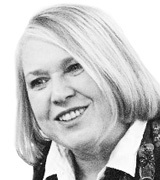 And there are doubts that a focus on immigration will help the Republican Party next fall. Not only is the public not as anti-immigrant as many Republicans are, but nearly three times as many adults say the party’s stand will hurt it as think it will help. Americans overall are divided on which party they trust more on the issue of immigration (with a third trusting neither). However, there is a sizable advantage for Democrats among Hispanics, a group Republicans say they need in order to win. Only 15% of Hispanics trust the Republicans Party more on immigration; nearly half say they trust the Democrats more.